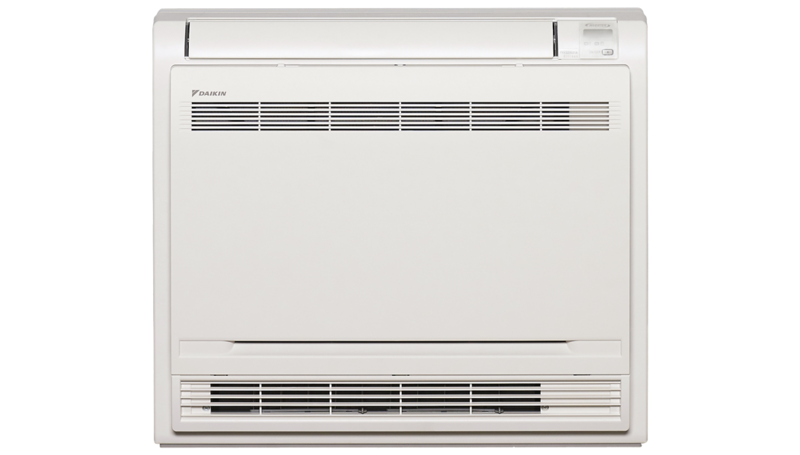 Daikin’s floor standing air conditioning units are compact and ideal for anyone wanting the convenience and access of positioning their unit closer to the floor. They come in a wide selection of capacities and can even be semi-recessed into the wall or in an unused fireplace. It's the unique features of Daikin products that makes us the world leader. Allows the unit to automatically switch between heating and cooling for year round comfort. Either top, or top and bottom discharge vents can utilised to distribute air evenly throughout the room. Heating operation commences only when the airflow is warm, preventing those unwanted cold draughts. Robust design enables the unit to operate from -15°CDB in Heating mode to 46°CWB in Cooling mode. The vertical flap can be set to automatically swing up and down for consistent room air distribution. Features the combination of a particulate prefilter for collecting dust particles and a titanium apatite deodorising air purification filter. The large swept blades enable air to be discharged quietly and efficiently via both the top and bottom discharge vents for even airflow into the room. Daikin’s DC Fan motor is efficient and compact, featuring five step fan speeds including quiet and auto mode. When operating in this mode, the microprocessor intelligently adjusts temperature and airflow rate to reduce humidity with minimal compromise to comfort.